We wrote God Made All of Me as a tool so you can explain to your children that God made their body. Because private parts are private, there can be lots of questions, curiosity, or shame regarding them. For their protection, children need to know about private parts and understand that God made their body and made it special. Our goal is to help you in protecting your child from sexual abuse. We wrote Rid of My Disgrace: Hope and Healing for Sexual Assault Victims because it is an important and prevalent issue. One in four women and one in six men have been or will be assaulted in their lifetime. Heartbreakingly, many of the victims of this epidemic are children: 15% of those assaulted are under age 12, and 29% are between ages 12 to 17. Girls between the ages of 16 and 19 are four times more likely than the general population to be victims of sexual assault. We want parents and caregivers to be smarter and better prepared than those who would want to harm the child you love and want to protect. While we know that actions by adults can be more effective than expecting children to protect themselves from sexual abuse, children still need accurate, age-appropriate information about child sexual abuse and confidence their parents and caregivers will support them. Education is important in prevention against inappropriate sexual behavior or contact. By teaching children about their body and discussing appropriate and inappropriate touch, you are helping them understand their ability to say No to unwanted touch, which will help them if anyone ever tries to hurt or trick them. Please consider taking the time to read this book and talk to your child about it. 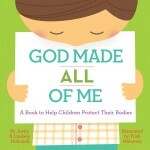 Get our children’s book, God Made All of Me: A Book to Help Children Protect Their Bodies. « Infographic for God Made All of Me	» God Made All of Me is Available Now!